1. I'm going away for a long time. I will be on a plane. Clearly I must take much knitting. Sweaters, however, are not particularly portable. Socks are portable. I must have sock yarn. (Flaw in this point: I already have sock yarn). 2. I'm stopping by a yarn store I've never been to. Seaport Yarn is fairly fabulous. Clearly I must support them. 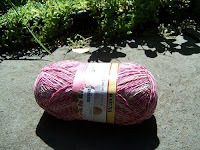 (Flaw: Buying yarn simply because there is a yarn store in existence is a dangerous way to live). 3. The Point has a sale. (Flaw: There is no flaw. This is a serious sale. Really, I'm amazed at my restraint). Aurora Yarns Acquerello. It's very pretty. It shall be Spina di Pesce. I am very excited. 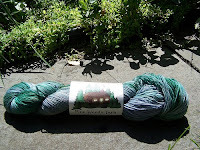 Pine Woods Yarn Wool/Nylon Sock. The colors don't particularly excite me (a little staid, I suppose) but I've been dying to make Rivendell, and here's a yarn that is simply begging to be Middle Earth. SWTC Tofutsies. Just 'cause. It's tofu and crabs and I liked the color and sometimes I have to branch out from woolliness. Punta del Este Mericash. And here is where everybody should really forgive me for the lies and deception, because look--I only bought three skeins. 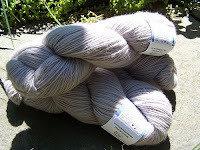 The softest, most beautiful greyish/lavender yarn I've ever seen, and I only bought three skeins. Just enough to make one shawl. I am very proud of myself. 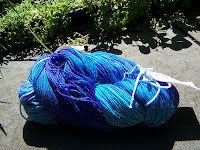 I think I'll be finishing Wellfleet, the sock I already have on the needles, and I'll take Spina di Pesce. Or Rivendell. Or both. Can't be too careful.